FOXBORO -- When a new player arrives to the Patriots, there's a familiar refrain that's recited from behind the podium at Gillette Stadium: "Football is important to him." Whether the subject is a rookie or an established veteran, those five words can serve as Bill Belichick's stamp of approval. It means the player cares. It means the player is willing to put in time. Belichick hasn't gone on the record on any of the members of this year's class of undrafted free agents just yet, but linebacker Brooks Ellis seems to fall into that category of players to whom football is important. If it wasn't, he would probably be putting all of his energy into getting accepted into medical school right now. Ellis was a two-year captain at Arkansas and one of 12 finalists for the Campbell Trophy, also known as the "Academic Heisman." He maintained a 3.82 grade point average as a pre-professional exercise science major with a minor in biology, he was the first two-time Academic All-American in program history, and he was the SEC's Scholar-Athlete of the year for 2016. All that is to say, Ellis had options upon graduation. Football won out. He agreed to a deal with the Patriots soon after the draft, and he's spent the better part of the last month trying to learn defensive terminology and special-teams techniques. But eventually Ellis hopes to be an orthopedic surgeon, and later this summer he'll submit his applications to medical schools in order to kick-start that process for whenever it's time to pursue his next plan full-throttle. If all goes well for Ellis this spring and summer, it could be a while before he's taking the Hippocratic Oath. The Patriots have a long history of giving worthy undrafted players a shot at the 53-man roster, and Ellis plays one of the few positions on New England's loaded roster that might have room for a newcomer or two. On paper, he certainly looks like their type. The 6-foot-2, 245-pounder was his team's leading tackler for two seasons. He played all three linebacker positions in Arkansas' defense -- strong-side, middle and weak-side -- and he started 31 consecutive games to finish his career. Ellis also has extensive special teams experience, and he recorded one of the quickest three-cone drills among linebackers at this year's NFL Scouting Combine. That he learned under Razorbacks coach Bret Bielema can't hurt his chances, either. Bielema began his coaching career at Iowa under former Belichick assistant Kirk Ferentz, and Belichick has dipped into Bielema's programs at Wisconsin and Arkansas several times over the course of the last few seasons. Running back James White, defensive end Trey Flowers and former tight end AJ Derby all played for Bielema, and Ellis joins fellow Arkansas rookies Deatrich Wise (fourth-round pick) and Cody Hollister (undrafted) on this year's squad. Robb Smith, Arkansas defensive coordinator from 2014-16, believes Ellis landed in the perfect spot. Prior to his time at Arkansas, he worked under Greg Schiano at Rutgers, where he coached Patriots safeties Devin McCourty and Duron Harmon, former Patriots corner Logan Ryan, Patriots linebacker Jonathan Freeny and safeties coach Steve Belichick. 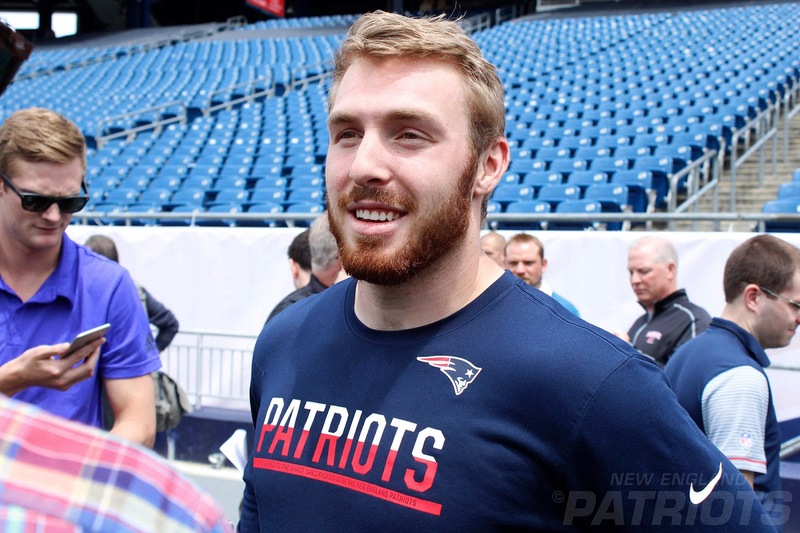 There's one more Patriots link connecting Ellis to New England. His agent, Neil Cornrich, has counted Belichick as a client and also represents Bielema, Ferentz, Flowers, Derby, undrafted Patriots rookies Cole Croston and LeShun Daniels (both of whom played under Ferentz at Iowa) and Patriots running back Rex Burkhead. It may come as no surprise then that when Ellis signed with the Patriots, no one knew. He didn't announce it on Twitter, as is the norm for undrafted players when they come to an agreement with a team. And the news wasn't leaked. Instead, he waited for the team to announce it, which his new employers probably appreciated. Ellis, who according to the Boston Globe received the fifth-most guaranteed money of the 19 undrafted rookies the Patriots signed, said he received some simple advice from Cornrich before making his way to New England. "He just said that you'll fit in well there," Ellis said. "You're the type of guy they like, and you're the type of guy that succeeds in that organization. Don't do anything special. Just go out there and work like you do every day, and it'll turn out for the best." Even if it doesn't, Ellis will have medical school. But he acknowledges there's some unpredictability with that path, just as there is being an undrafted player in the NFL. He still has to be accepted. His application, including personal statements, interviews and MCAT results -- "It was horrible, I don't want to take that ever again," Ellis said -- still has to be deemed up-to-snuff. Whenever Ellis starts, it will be the beginning of almost a decade of training between schooling and residency. It will be a challenge, he knows, and it's one that he looks forward to. But he's hoping it can wait because football is important to him. "It just makes you work harder," he said of his uncertain future. "It makes you really focus on right now, and make sure that you're doing all you can in this area because even the next area might not be there. "That's what I've done. I'm just working as hard as I can on this, and if that doesn't work out, then I've got the next thing, and I'm going to work as hard as I can in that area."